Not two months after threatening to stabilize its currency with a (failed) public referendum on the gold standard, the central bank of Switzerland announced last week that it will no longer attempt to "peg" the Swiss Franc to the Euro. This immediately resulted in an immediate 40% leap in the price of the Franc and threatened the bankruptcy of one or more highly leveraged currency trading markets. The decision seems most likely in response to an announcement by the European central bank that it will attempt a massive stimulus program (i.e. currency devaluation). It would have been devastating to the Swiss Franc were it to respect the peg and follow suit: public speculation that Switzerland would drop the peg started last month if not before. This event may lower the ability the EU to conduct their planned currency devaluation. There is also now the inevitable talk of harm to Switzerland's exporters due to a rising foreign exchange rate: the peg was first implemented in part to artificially help said exporters by lowering same exchange rate. What the mainstream (Keynesian) press generally will not mention is that Swiss consumers will be helped by the same degree by lower import prices, and by an additional amount due to lowered inflation. Whatever one's views are on this, the event certainly does demonstrate some of the hazards of modern central banking. When such devastating power (as can be wielded by a central bank) is concentrated into the hands of a few, those few can decide, without public input, to do devastating things. Solar arc North Node and progressed Sun at Switzerland IC: movement of energy from the public sphere to the private/domestic. Progressed Chiron in the First House trine natal/progressed Pluto in the Sixth House, solar arc Chiron conjunct natal/progressed Pluto: active adjustment/healing regarding power/banking in aid of the workforce. Pluto, Uranus, the Nodes, Venus, and Mercury all in aspect to Swiss Ninth House Jupiter, ruler of the Second House: a massive, sudden, karmically-charged public action regarding money and power. 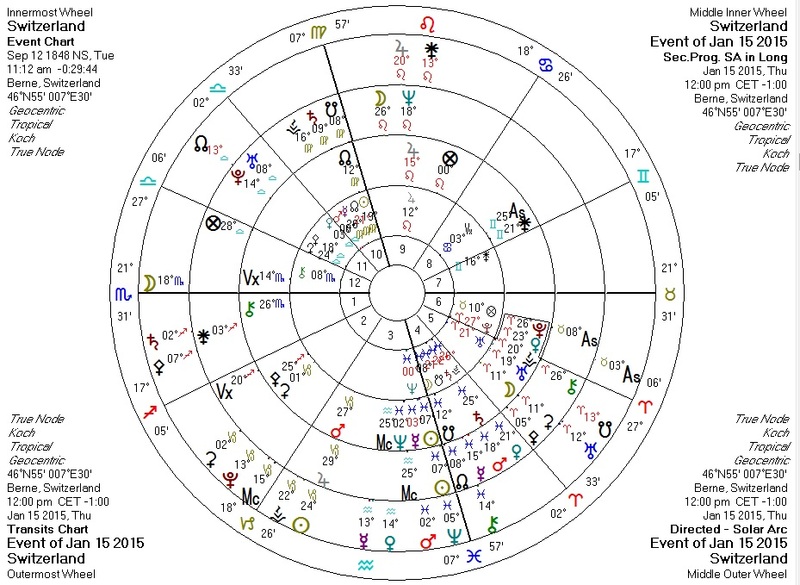 Transiting Uranus and South Node conjunct progressed Moon, ruler of the Ninth House: a shocking public development involving the general population and involving loss (to Europe, probably not so much to Switzerland).